The February 2009 issue of the Flemish magazine Eos, focusing on the popularisation of science, has as its cover theme 'De dieren van de toekomst' ('the animals of the future'). Now that is an interesting theme! Anyone with an interest in the subject will immediately think of Dougal Dixon's book 'After man, a zoology of the future' (see my installment on 'Why there's no walking on tentacles' for a glimpse at one of his other works). Eos' story is about a new exhibition in Brussels' natural history museum, in which a new evolution gallery opened on February 12 2009, the 200 anniversary of Darwin's birth. Apparently the museum people decided not to let evolution simply stop right in our age, but to leave the clock ticking for another 50 million years into the future. This period is called the Dixonian, so it's clear the people behind it have done their homework. Congratulations Dougal! The page of the museum website is in Dutch, French and English (but not in German, which is odd, as it is spoken in Belgium and the main museum page does have a German version). It is frustratingly devoid of images of future lifeforms. A bit of internet searching led to a site promising a video of the animals, but at the time of writing the video did not work; I will include the video link here in the hope that it will work later on. So all I had to give you some more information was the magazine. Pick it up, if you can (and can read Dutch). 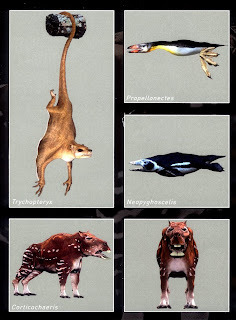 Above is an image taken from the cover; it shows five of the to-be-evolved animals with their names. 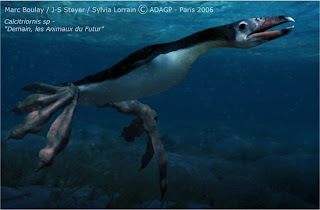 This is a close up of Neopyghoscelis, a penguin descendant reaching up to 4 meters in length. I wonder whether the image shows a young animal, as the size of the eye seems much too large for a 4-m bird. Eyes don't usually increase in size at the same rate as overall body size. Anyway, one of its more interesting features is that it redeveloped teeth. Looking at the image I thought that these were pseudoteeth, i.e., bumps developing from the rim of the penguin's beak, but the text suggests that the teeth are the result of the genes for teeth, dormant in present birds, having become active again. I wonder if that event is more likely than reshaping the rim of the beak, but either 'solution' would do the trick, I guess. 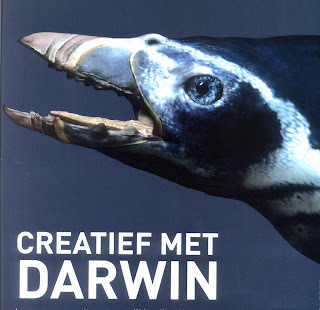 The text says 'Creative with Darwin' in Dutch. And this is a Propellonectes (remember that name!). The legend says that is a descendant of a present-day petrel, that has lost its wings and swims with much enlarged feet. It is about 1 metre in length. The image above should whet your appetite for more. Dixon lovers will recognise this as one of his creations, a Tetraceras. But if that isn't enough, the task force also included Sylvia Lorrain, and her website tipped me from just containable envy after seeing Boulay's work into a feeling of deep inadequacy; they are that good. She combines 3D models with photographs to produce realistic depictions of animals, which is very tricky as it soon becomes tacky. She pulls it off. This particular bird is something I found on her site. Be certain to visit their sites, as there is more to see there. Obviously, this is a diving bird, and it's called a Calcitriornis. Hang on, that is the same bird shown in Eos as a Propellonectes! What is going on here? Calcitriornis evolving into Propellonectes? I think I will try to find the story behind this matter another day. Now it's back to Brussels, so to speak. The team so far had everything it took to depicting 3D animals, but in 2D! The museum apparently wanted 3D items to display; ironic, in a way. The sculptor Yves Gaumetou did the final job of putting flesh on the digital bones. It's probably modeling clay or something similar, but the results can be touched and you can walk around them, and that was the point. 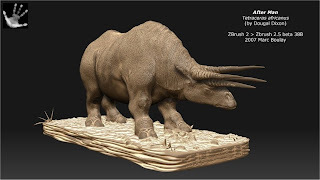 His site contains excellent sculptures of present day animals in life-like poses. I definitely think I will have to go to Brussels one of these days. Remarks added in December 2010: Seeing that Darren Naish of Tet Zoo directed some traffic to this old post, I looked at it myself, and found that some links no longer worked and that the post is behind the news. Here is an update. Other newsworthy items may be that Sébastien has written a very nice book on early vertebrate evolution, available in French and Dutch (as far as I know). Marc and Sébastien are working on a book on future evolution on Earth; you can read more about it on Marc's site. Finally, I later wrote some more on the Brussels expo and on Marc and Sylvia's work. If you want to read it, here is a post that links to the other posts. Gert, can you tell more about it? Not that much, in fact, if you are referring to the exposition itself. I have not (yet) found more images etc on the internet; only the ones that you see on the sites I supplied. The article is three pages, and does not contain other images of the animals than I showed you (well, the same ones but a bit bigger). The text goes into continental drift in the future, the choice for ecosu=ystems and why the animals that are actuallu shown were depicted. There is mention of a snake they designed: it hides the largest part of its body under the ground, apparently catching prey with the part above ground. The animal hanging from its tail is a large marsupial, aand the large tetrapod is a Corticochaeris, a descendent of the capibara, but 2 m in length. That's largely it. Then again, I will probably be writing another blog entry on the design team behind the exposition. I wil also put up a very short message with a link you may find interesting. I just want to know one thing. I respect D. Dixon for his epochal step - futuristic and alternative biology. But his ideas sometimes (in at least 2/3 cases) are imbrobable from the point of view of the theory of evolution. Sometimes they contradict the principles of evolution, and because of it they turn to the subject of jokes ond laugh of biologists and simply people studying the theory of evolution for themselves. I had seen some much more interesting and correct Internet projects like Spec. But, alas, money do their job very successfully. But I doubt anyone complained. I like to think that that was because everyone with any knowledge of biology took the dragon's 'evolution' as it was intended: a tongue-in-cheek joke, a game if you will. I admit that I do not know how many people took the explanations seriously, which would be a real pity, as it would make it more difficult for them in the future to understand biology correctly. Does that mean that the DVD should not be made, or sold with a list stating which items are not unambiguously scientifically correct? Every Hollywood film, particularly the science fiction ones, would need a list the size of a telephone book! I am not certain if this reasoning covers your point, so let me try again: if people question the truth of evolutionary biology because they object to bits of fictional biology, they are getting two things wrong. The first is that they are confusing science with fiction, and that is an utterly invalid comparison. Do they same people argue that astronomy is all wrong because the spaceships in Star Wars make a sound as they travel through space? The second problem is that they apparently have no sense of humour or irony. Pity them. No, I mean another thing. First of all, there are many rules and principles in evolution - it is not developing of everything into everything. Cope's rule, Allen's rule, Marsh's rule and so on - there is a great set of such ones. Oh' I understand they are empirical and have some exclusions. But in our predicting of evolutional processes we must talk in terms of probability/improbability. These rules and principles are the rules of the game. The presence/extinction of mankind and the degree of its influence to the nature to the moment of extinction are also a part of problem specification. The initial appearance of flora and fauna is the material for further speculation. And then the probability of extinction/surviving of species is estimated, and possible ways of its evolution (according its anatomy and present day habit of life) are proposed. So, Dixon goes another way. Now I look at his ideas from "New Dinosaurs". He takes the animal and asks himself: "what may be an appearance of a browser (grazer, predator, filter-feeder, etc.) evolved from this one?" And he "sculps" giraffe from pterosaur (it's his lank), the hummingbird from dinosaur (gimp), elephant from squid (megasquid from "The Future is Wild"). And in all these cases he does not think: is the way of evolution in such direction probable for this group of animals? Till millions years of existing on the Earth cephalopods hadn't develop even fresh water, and he "banishes" them to the land of awful freshwater rain! That's the reason of my scepsis. You may have a point there, Pavel. I dug out my copy of the 'New Dinosaurs' (1988) and checked up on the lark. The text states that dinosaurs were beaten to the grazing niche in the new grasslands by pterosaurs. By itself such a thing could happen, as long as the pterosaurs more or less had the place to themselves during the transition from flying to walking forms. You can envisage such a thing happening on a large island where the niches for grazers are not yet filled by more efficient grazers and where there are no rapid predators ready to take advantage of stumbling pterosaurs. The lark lives in the Ethiopian realm however (Africa). While it may have been devoid of grass-eating herbivores in Dixon's scenario, but there does not seem to be any information on the absence of predators. With various types of predators around, I doubt the ancestral pterosaurs could have afforded the luxury of forgoing flight. By that logic, they would indeed stand very little chance. You are right that they are not the most logical group to evolve into that niche. What bothers me a bit though is the ostrich; present-day ostriches have excellent sight and can run very fast, so now they gcan hold their own amidst lions, cheetahs, leopards, hyenas and wild dogs. But what about their evolution? How did they manage to get where they are now with all kinds of large cats around for their entire evolution? On the whole I agree that the story could have benefited with some more fleshing out. Perhaps Dougal did think of all such things; I would not be surprised at all. For all we know he has lots of additional details lying around in an attic. What I do know is you should always keep your readers wanting more. It would be nice if he (Dougal) would comment, but I doubt he will. Dixon's "The New Dinosaurs" on-line. oh my god... those pelagornids are so gorgeous. One of them looks suspiciously like a Hesperornith, though. And 4 meters! Heck yes! Why stop there, you know those things have got to get at least Mosasaur sized, when has "modest" been a trait applied to Dinosaurs?